Aquatic biologists Jen Hazeres and Scott Brehob are perched over the open water of the Surrounded by Sharks exhibit’s 385,000-gallon tank at Newport Aquarium. Brehob has his eyes on the aquarium’s four adult shark rays and his hands on a specially-designed pole with a target on the end. Hazeres, waiting for her cue, holds a similar pole with a shark ray’s afternoon snack clamped to the end. Brehob expertly maneuvers the target underwater, luring the trained shark ray to the surface, and Hazeres quickly offers the food at the exact right time and place. With a splash of water, the unique, 9-foot creature breaks the surface and simultaneously claims its prize: a Caribbean spiny lobster. It’s called target feeding, and aquarium guests can catch a glimpse of it twice a day. Each shark ray will eat two lobsters at a time during the feedings. The biologists know exactly what to feed them and know each of the shark ray’s individual markings by heart to ensure each one gets its fair share. View more photos here . While the actual feedings may take only a few moments, the behind-the-scenes prep work required to prepare the food is immense. And that’s just for one species. There are literally thousands of animals housed at the aquarium, and each of them has a special diet. If you’ve ever wondered how much food it takes to feed all the animals you see when visiting our local aquarium, think big. Collectively, the animals eat about 140 pounds of food every day. Many also receive a variety of vitamins and supplements, since freezing fish can make it less rich in certain nutrients. Add in some picky eaters, big eaters, and a mischievous loggerhead sea turtle that needs to be separated at feeding time (we’re talking about you, Denver), and keeping the animals fed becomes a full-time job for more than a dozen caretakers each day. The aquarium’s in-house prep kitchen is always abuzz with activity: On any given day, about 10 staff members and three volunteers divide and conquer tasks. Fish must be cut into pieces, and some crustaceans, like the aforementioned spiny lobsters, must have their legs and spines removed prior to feeding time. Fresh produce must be chopped. Meals for some species are even weighed. Vitamins and supplements, in the form of both pills and gel, are counted or measured and stealthily hidden in some of the food. Some animals, like the aquarium’s different species of sharks, must always be provided with the extra nutrients. In the Surrounded by Sharks exhibit, the sand tigers are the largest and most intimidating-looking sharks in the tank with their protruding, pointy teeth. They’re also some of the pickiest eaters in the tank, according to Brehob. They’ll only eat certain types of fish at certain times. And while you might think the large sharks eat the most food per day, they don’t even come close. The penguins hold that title. Eating as often as three times a day, the aquarium’s feathered friends eat about 65 pounds of food, including different varieties of fish and squid, every day. While the sheer number of animals to feed does present certain challenges (the aquarium’s freezers have to hold about 12,000 pounds of food), one of the biggest chores is keeping up with the changing needs of the animals and their environments. Since the aquarium often adds and updates exhibits to keep longtime visitors engaged, new animals and feedings added to the schedule are the norm. For example, longtime resident Sweet Pea, a shark ray, gave birth earlier this year to a litter of eight pups that have a demanding feeding schedule. A new exhibit, Seahorses: Unbridled Fun, is also opening this spring. The new inhabitants have a very specific diet, Brehob said, and eat live foods. In addition, food at the aquarium isn’t always about nutrition. Some food items are given to animals specifically for enrichment, and those change often as well. In the wild, animals hunt, dig and forage for food. To keep the animals in an aquarium setting stimulated, biologists are constantly seeking ways to provide species-appropriate challenges to help them mimic behaviors that occur in their varied natural environments. 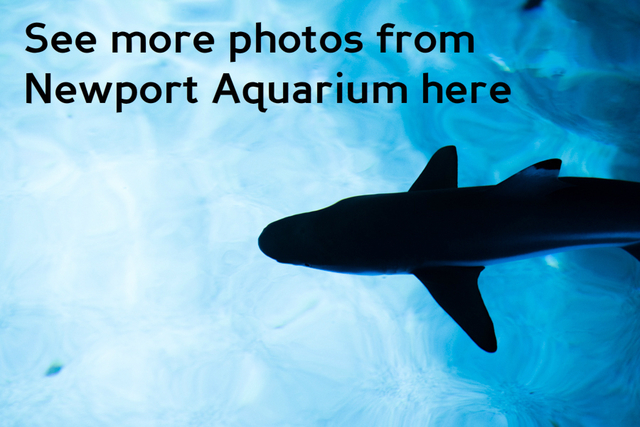 Some of the most unique species can be the most demanding in terms of care, but those are often the animals that draw visitors to Newport Aquarium, Urban said.